Who Is That Mustachioed Man? Why ... that can’t be Ichiro? The Mariners’ special assistant to the chairman is not an active player or coach or trainer, so by MLB rule, he’s not allowed in the dugout during games. 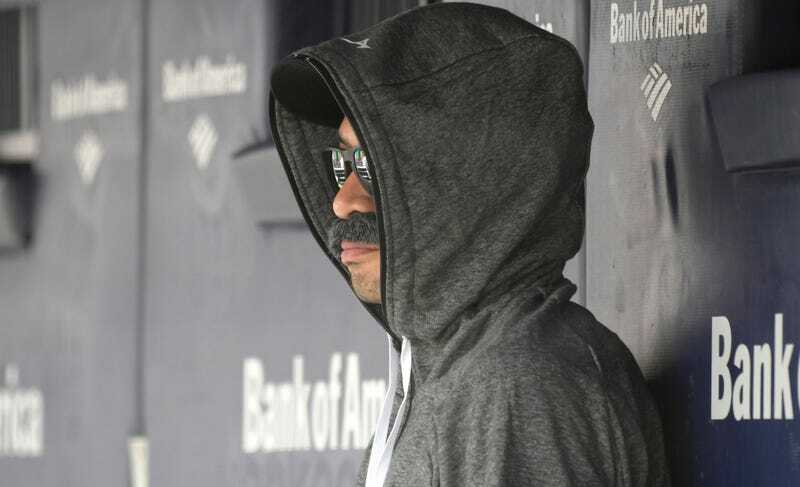 The gentleman photographed above during the first inning of yesterday’s loss to the Yankees, therefore, must not be Ichiro, despite looking an awful lot like Ichiro wearing a hoodie, shades, and a bushy mustache. Ichiro’s back in the news this week, and frankly, it’s excellent. On Wednesday, the “Get Ichiro in the Home Run Derby” campaign officially launched, and it’s got the momentum of a runaway freight train. (You really do hear it, more and more.) As I was blogging that, I remember raising an eyebrow at a seemingly throwaway line in a writeup at 710sports.com that noted that while Ichiro ostensibly doesn’t sit in the dugout, “he tends to be the first one out on the field after a Mariners win.” Hmmm. Either he’s very fast, to be able to rush out from the clubhouse or the tunnel faster than any players are able to rise from their dugouts seats and climb three steps to the field, or he’s got a scheme going. Which genuinely raises the possibility that yesterday’s fake mustache wasn’t a one-day stunt, but rather that Ichiro has been disguising himself and sitting in the dugout for the last two months and no one noticed until now. God, I hope it was that one. The ‘stache, naturally, brings to mind Bobby Valentine, who in 1999 as Mets manager returned to the dugout in disguise after being ejected. Valentine was sent a photo of Ichiro, and approved. “He was perfect. I never would have known it was him,” Valentine texted to The Associated Press. 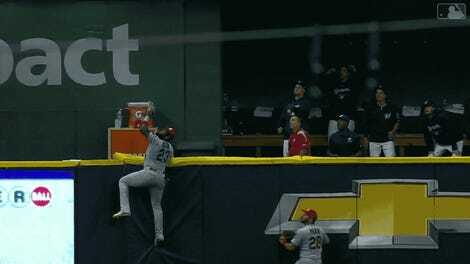 Valentine was suspended two games and fined $5,000 for the stunt. MLB, you’d better not do that to Ichiro; don’t be cops.